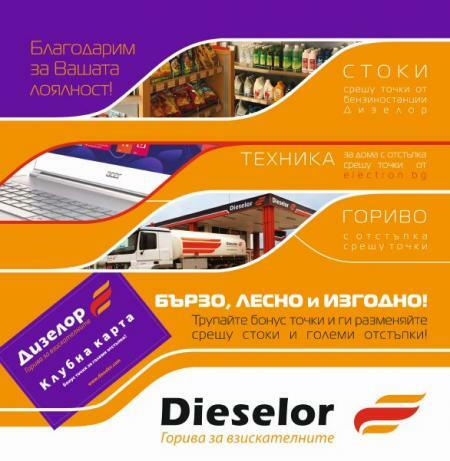 You can take your Club Card from every Dieselor's petrol station. Hand your Card to the operator when fuelling so that bonus points can be marked. Every litre of fuel, gasoline, diesel or LPG, adds 1 point to your Card. You can trade your collected bonus points for big discounts on diverse goods at the petrol stations: car accessories, foods & drinks, etc. You will find a big variety of gifts and discounted goods that can be traded for your bonus points.Take a promo code for 5% or 7% discount when shopping appliances, instruments and gifts from the biggest, Bulgarian online shop: www.electron.bg! You can ask information about the amount of bonus points you possess as well as the discounted goods available at every petrol station.